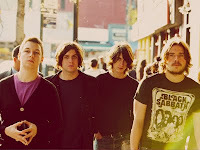 After over a year, the English band Arctic Monkeys will be kicking off a North American tour b eginning May 17. They of course will be making a stop in our lovely city. The band will play Central Park's SummerStage on Tuesday, May 24. A full list of dates are below. Pre-sale and ticket info can be found on the bands website, HERE. Arctic Monkeys - Alex Turner, Jamie Cook, Nick O'Malley and Matt Helders - haven’t performed in North America since criss-crossing the country in the wake of the release of Humbug, their acclaimed third album. Fans can expect to hear some eagerly awaited new material – the band posted a video preview of brand new song “Brick By Brick” on their website late last week.